The Roman Emperor Vespasian and his son Titus constructed the Roman Colosseum, built with the proceeds of money taken from Jerusalem. Many Roman Emperors enjoyed the spectacles that the Colosseum had to offer and many of the games were financed by the emperors themselves in order to gain favor with the 'mob'. There was even an Emperor who took great delight in participating in the games held at the Colosseum - the Emperor Commodus - who was featured in the movie Gladiator starring Russell Crowe. Much of the movie was fiction rather than fact, for instance, chariots were never used in the Colosseum. This section features the history, facts and information about the famous Roman Emperors together with short biographies and facts about the part the Roman Emperors played in the persecution of the Christians and the history of the Colosseum and ancient Rome. A Short Biography, Interesting facts and information about the emperors of Ancient Rome. 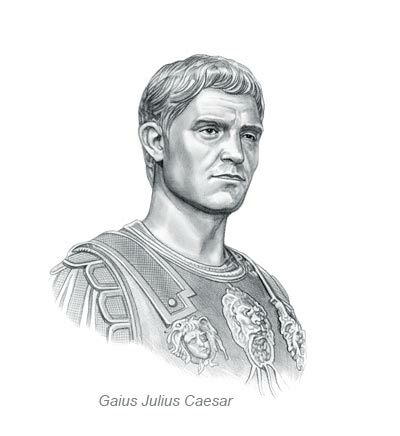 The word "Caesar" was originally the name of an aristocratic patrician family of ancient Rome, the most famous being the dictator Julius Caesar who seized power when Rome was still a republic. The adopted son of Julius Caesar was Octavian who became the first Roman Emperor, taking the name Augustus Caesar, and all of the successors in the family used the name Caesar. The term became synonymous with the Roman Emperors and each succeeding emperor retained the name "Caesar" as part of their title. The content of this category on the Emperors of Ancient Rome provides free educational details, facts and information for reference and research for schools, colleges and homework. Refer to the Colosseum Sitemap for a comprehensive search on interesting different categories containing the history, facts and information about the all powerful Emperors of Ancient Rome.